Over the past months I’ve been struggling with my 5-year-old in church service. He is so noisy. And active. And stubborn. Pretty typical for someone who’s only been on this earth for 5 years, right? So, we spend a lot of time in the hallway. Waiting. Sometimes peacefully but most of the time he and I are both in a state of agitation. I think I could count on one hand the number of times I’ve heard my husband preach since he was installed in September. We walk home and try to talk about the service and I have no input because I wasn’t really there. There are a lot of moving parts to this problem but I really thought I had figured something out last week. We went to service and I had prepared by packing ‘the church bag’ complete with (what I thought were) quiet toys and Hi-Chew candies. I found a typically quiet corner of the south chapel and settled in. Service started and we were doing really, really well! My son was keeping it together and following along a little. He was flipping through the hymnal to find where we were. It was great and I was feeling super awesome about my parenting skills. Seeing that the sermon was going to start soon I suggested a quick run to the bathroom so we headed down to the family bathroom down the hall. Things you should know… This bathroom has no windows, automatic lights, and a lock. I’m sure you know the type. To make a long and involved story short our peaceful, #parentingwin situation quickly turned into a #parentingfail situation when my boy was locked in the bathroom alone when the automatic lights turned off. There was sheer panic and much screaming as I, and a small band of church friends and the building manager, worked to free the small boy sitting in the dark. We missed the sermon. When we panic we can’t see the light. Sure there is that split second when our eyes are adjusting that we can’t see anything but then our eyes adjust and start to see again. When we went back to church a few days later we went back into that bathroom and turned off the light and sat there together in the dark. Yes, it looks different but that’s alright. God is in the different with you. When we panic we can’t hear our community speaking into our situation. This sweet child who found himself in the dark was screaming so loudly all he could hear were his own cries even though there were 3 grown adults shouting encouragement and instruction to him on the other side of the door. Once we calm down the dark can be a fruitful and wonderful place. Both at the time of the incident and when we visited the bathroom later both he and I marveled at how much light was coming in under the door. Once he calmed down we were able to coach him to “carefully stand up, put your hands out in front of you and slowly walk forward”. While he was doing that we heard him giggle and say “MOM! My shirt is glowing in the dark!!! It’s so BRIGHT!” All things he couldn’t see when sheer panic and fear had taken over. Part of Advent is waiting. And for the most part we are waiting in the dark. Physically waiting in the dark as the days grow short and cold, and, as we wait for the Messiah, waiting in spiritual darkness. Darkness is not typically fun. But Rev Barbara Brown Taylor suggests and encourages us to embrace the dark as a place of learning and connecting with God. Taylor suggests that learning not to fear the dark takes time and practice. We have so many ways to shoo away the darkness that it also takes sheer determination to voluntarily place ourselves in the dark. God is the creator of darkness and He thinks it’s a good thing. Darkness is part of our life rhythm. It is okay to sit in our darkness and not fear it. 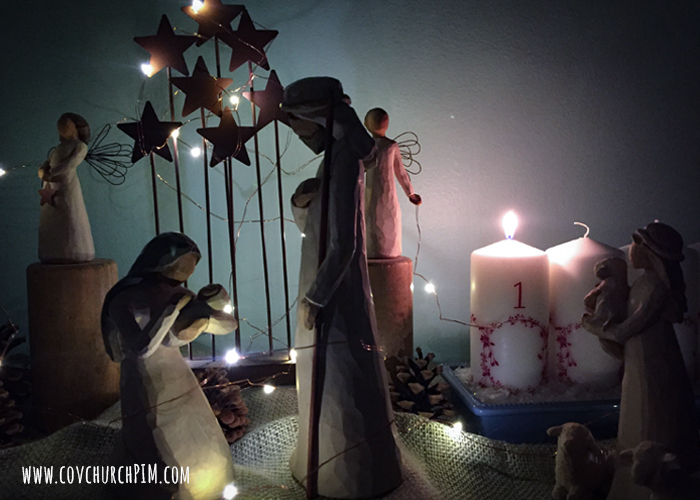 Let us go forth this Advent season and remember that God has not left us. Morning really will come again. Even in the midst of winter spring is still coming and with it new life. While I firmly believe it’s okay to sit in the darkness and learn from it there are some types of darkness that need more support to deal with. Depression, anxiety, addiction, and chronic illness are a special kind of dark that needs extra support. For many Covenant pastors and families Bethany Benefits provides excellent benefits including mental health and substance abuse support. Bethany Benefits is bound by HIPAA so any treatment you receive through your benefits is confidential. I know not every pastor/family has access to Bethany Benefits so it is worth a call to your insurance company to see how you may be covered. If you feel you are in crisis mode there are folks in the Ordered Ministry office that are happy to talk to you and help point you in the right direction. You can call them at (773) 442-6584. What a great story and a wonderful parenting moment (even if it didn’t seem like it at the time). Thank you for sharing and the reminder to find God in all sorts of dark (literally) places. Here’s to hoping you’ll get to hear a sermon one of these Sunday’s soon!